An MSc student who has stuttered since the age of six is using virtual reality technology to help rehabilitate people with speech impediments. 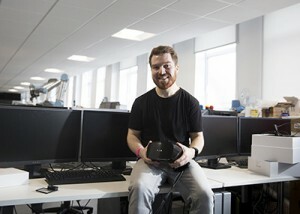 Gareth Walkom, 24, an MSc Medical Product Design student at Nottingham Trent University, is developing software to allow people to confront social anxieties in a virtual environment. The technology provides exposure therapy for simulated situations which trigger anxiety. By repeated exposure to such situations a person can overcome their fear to better prepare themselves for anxiety-provoking real-life situations. Further information from members of the public can be obtained by liaising with Gareth directly, via gareth.walkom2012@my.ntu.ac.uk. Previous Post UK Air Pollution and its Impact on Indoor Air Quality (IAQ) in Schools Next Post Irlen syndrome - Wear your rose-coloured (or blue or green) glasses…and read on!